Apart from the Shanhai Pass of the Great Wall itself, the defenses of the vital pass include two additional sections. Firstly there is the Old Dragon's Head and the attached Great Wall of China (the only part of the Great Wall that meets the sea) closing the gap between Shanhai Guan Pass Gate and the Sea in the East, and secondly there are the Jiashan Mountain due west of the City of Qinhuangdao, which are the first sections of the Great Wall of China to climb from the north China plain into mountains of Hebei Province). The Great Song Era historian Ouyang Xiu 1007 AD - 1072 AD) once wrote on the Matter of the continuous raids by Nomadic Tribes against Han Chinese Communities; "Our Chinese Infantry Men are at their Best (in war) in obstructing Passes, while the Barbarian Cavalry is at its Best on the Flat land. Therefor, let us resolutely stand guard on the Passes, and let us not drive after them in pursuit or in order to get rid of them. At the Time when they come, we should close and defend the passes so that they cannot enter (our lands). When they leave we should close strategic passes (as well) so they cannot return". And so it was done. Although in the Song Era only modest defenses on scattered passes on the Northern borders had been erected, during the Ming Era the Great Wall would finally become one unified defensive system. Soundbonus: Chinese Folk Classic "The Great Wave crashes (on) the Beach", traditional Chinese Pipa Music by Liu Fang. After lenghty battles had already been fought out between Japanese Armies and the Kuomintang and Communist Party Volunteers during 1932 AD, in 1933 AD the Japanese Army, bent on including the Chinese Territory of Rehe (parts of Hebei, Liaoning and Inner Mongolia AR today), attacked the Shanhai (Guan) Pass. The attack was initially repelled by the Chinese Garrison ready on the Great Wall and inside the Fortress, however eventually the Japanese beat them back suffering heavy casualties. After the taking of the Shanhai Pass in 1933 AD, the Japanese Army could move on to include Rehe, and encircle the strategically important Northern Capital of Beiping (Beijing). Although the battle for Rehe would last 3 months longer, seeing 20.000 Chinese soldiers dead, the Chinese Lines crumbled under the efficiency of the Japanese attacking force. 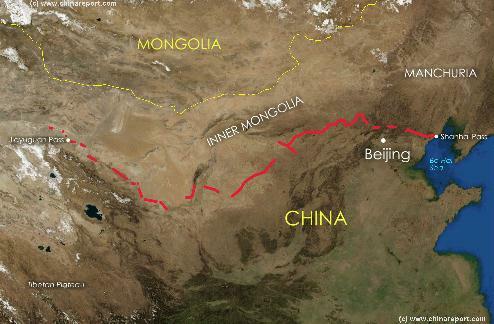 Next up were the Great Wall of China passes on direct approaches to Beijing in Eastern Rehe. More battles at the Great Wall of Jiumenkou and Jifengkou (Xifengkou) between the Japanese Imperial Army and the 29Th Route Army of the Chinese Communist Party. Both Xifengkou and Luowenyu (in Hebei province) were vital passes on the road to Beijing and commander Song Zheyuan was responsible for the village of Lingzikou, both passes and the distance to the village of Malanyu. The very next night on March the 11Th, a small Chinse Group challenged the cold night and the falling snow to raid the Japanese soldiers in their own camp. In the early hours of the 12Th of march, the raiding group found a Japanese Artillery camp where the soldiers of the 14Th Group were sound asleep. A deadly mistake of the overconfident Japanese Force. 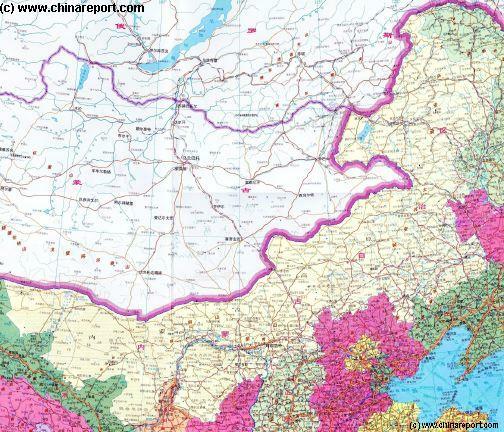 Helpful Geographic Map of Inner-Mongolia showing the larger geographic relations in the Region. importance and pathway of the railroad Baotou Connection. Gate, Gate Fortress and City, and then there are the mountains. The other sections are described seperately. These are: Old Dragon's Head (Laolongtou) and its Wall in the East, and the Jiashan Sections in the West. of Liaoning Province as the Jiumenkou Great Wall. From there the Wall follows along the border with Inner-Mongolia Autonomous Region past Yixian, Haicheng, Liaoyang and Shenyang. North of Shenyang the "Northern Wall" continues heading towards the Korean Peninsula where it ends today at the Tiger Mountain (Hu Shan) just north of the City of Dandong on the North Korean border. The original Wall however, reached even further, into North Korea to include all of the City of Pyongyang - a Chinese enclave and protectorate until the dying years of the Qing Dynasty (1368 A.D. - 1644 A.D.). In recent years many ruins been found indicating further walls in and near Korea. Returning to the Great Wall of Shanhai Pass on the coast: The Great Wall of China at Shanhai Pass (Shanhai Guan) is one of the most famous Gates on the Great Wall, for many reasons but most likely for the Chinese-Mongol showdown that occured at the Gate of the Pass when the armies of Genghis Khan arrived bent on Invasion. Four days later on March 16Th the Japanese re-attacked at Luowenyu, attempting to zeize the strategic Sanchakou Hill. Being held back, on the 17Th the Japanese Air Force arrived and a full offensive combining air assaults and artillery attacks followed. Again the Chinese strategy was to let the Japanese come in close so they would lose their artillery and air support. Hand to hand combat on and around the Wall ensued throughout the day until darkness fell. In the night however, the Chinese Armies again counter attacked. This time Chinese forces surrounded the Japanese Camp-sites and annihilated them in a final lenghty battle.